Hi everyone, greetings from the overgrown and overaged piggy once again (aka the wild boar ). Last Sunday, I did not go to ' search ' (err I mean church, for I have a missing front tooth and can't pronounce that word properly hehehe) for this old boar has been very naughty the past week. So for want of better things to do in the next 2 hours I decided to look around the fridge and pantry in our humble sty. So today, I will share with you all how I prepared this for the Sunday’s evening dish. I used up the ½ kg of meaty pork ribs and this was my favorite cut as it came with some parts of white cartilage bone and not the type which is the full hard bone. And being my lucky day too the pork belly was also another one of my favourite type as it is not too fatty and has a good strip of skin still attached to the cut strip. I went hunting around the kitchen and was lucky to find enough garlic to get started which is an absolute must have, 2 whole cloves of garlics (which is about 20 little pips altogether) You need to chop up 1 clove finely and add to about 3 tablespoon of cooking oil and lightly fry over low heat for 2 minutes. When you smell the lovely garlic emanating from the wok quickly put in the pieces of pork ribs and fry for about 10 minutes as this helps to prevent the meat from separating from the bones during cooking. 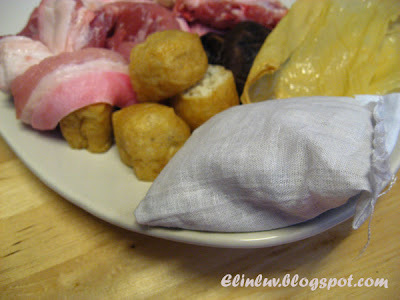 Do the same for the whole uncut strp of belly pork and just as the meat changes colour (still uncook) its time to stop. Put every thing to simmer and while this is happening I went to my favourite corner of the pig sty and switched on the air con for one and a half hours and I would advise you to look for a nice dvd movie or a good book to read and in no time at all lunch or dinner is ready. Just sprinkle some freshly cut coriander leaves and “yau char kwai” into the claypot and with a pair of kitchen scissors you can now officially and feeling much like a politician cutting a ribbon ( the belly strip) and serve amidst the imaginary claps of non existent spectators and camera flashes! 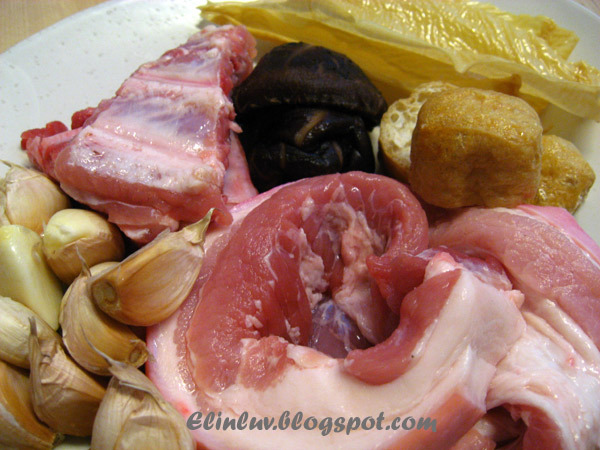 If this makes you crave for Bak Kut Teh then our thanks go to Sonia for bringing a piece of Klang to Ipoh hehe. Tata, till the next time wok with the boar ! A great comfort food! 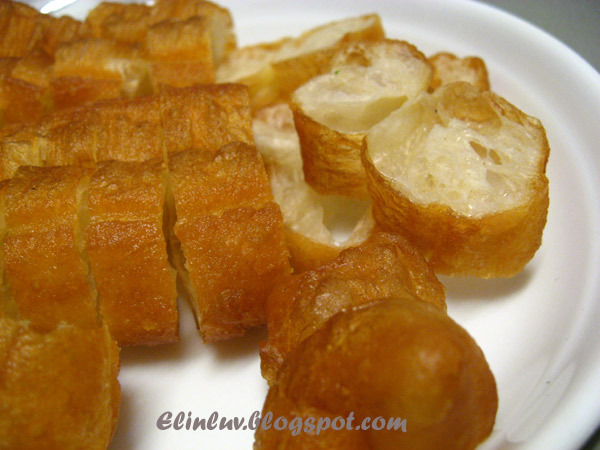 Love to eat "you tiao" with it too! Wonderful post. Great use of amazing bold flavors. 10 out of 10...Cheers! Deliciously yummy! My kids love Bak Kut Teh too, they won't hesitate to slurp it down despite it's steaming hot! Sounds like a very satisfying and flavorful dish! You are so lucky to have an assistant to blog for you! 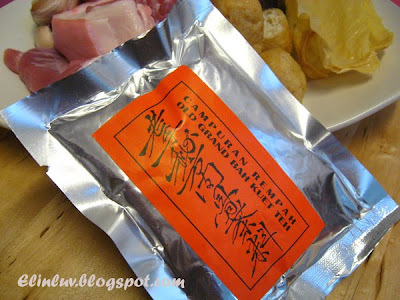 Great post, enjoyed reading it and love this dish because of the 'yau char kwai' and the 'tau fo pok'! Can smell it too! Hmm wild boar awesome awesome awesome....hi dad! Elin, you and your better half are both equally good cook! 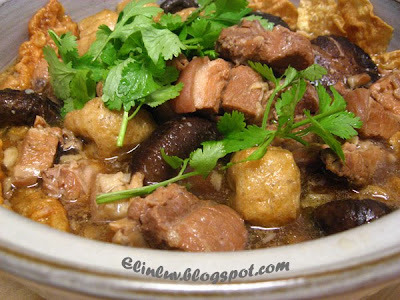 The bak kut teh look so delicious, yummy! I have a few packets of that mix too! 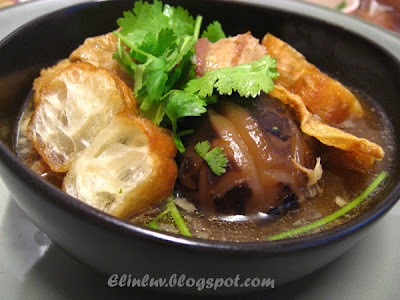 Just got bk from Malaysia but I'm missing bak kut teh already! Wah! Your Bak Ku Teh really make me feel hungry! I must go back home to eat this soon. wah, this look exactly like those selling outside, simply delicious! The Wild Boar say hi to all who have left lovely comments here. I don't know if I've ever eaten this. But it does look delicious and I'm a huge fan of the long deep fried bread. I remember visiting L.A. in January and ALL of the Chinese bakeries we visited in Chinatown HAD NONE. it was really depressing and your images are reminding me of their amazingness. 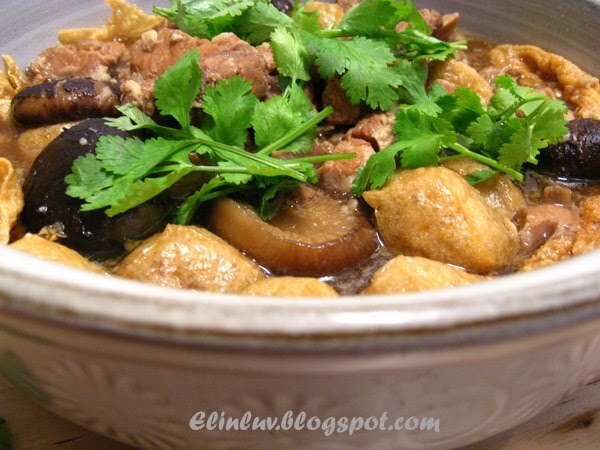 LOve the foto...clear n sharp n ur family must have enjoyed the dish :))) looks like a comfort food indeed. 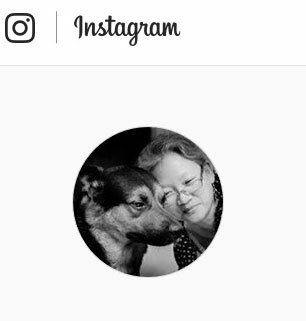 I am just wondering where i can find that source?? Btw I tried similar dish before without crullers though. I wanna try that with crullers soon.